I am very pleased with my home-made crispy roast pork. With it's crispy skin and fragrant and juicy meat, my family agree that it is simply delicious! Salty and tasty, whether you eat it as a dish or down it with wine, it is still a prefect fit. The advantages of home-made crispy roast pork is that other than being fantastically delicious, it is also cheap and economic to prepare. After all, roasting the pork is not too difficult, so why not give this recipe a try? 1. Try to have a flat and same level of pork belly (for even browning when roasting) by cutting off those extra meat underneath ). Blanch the pork in a pot of boiling water for 5mins. 2. Remove and wipe dry with paper towels. 3. Prick the skin all over with a sharp skewer, the more holes you can make the better. 4. Then use a sharp knife to lightly score the skin. 5. Massage the dry rub into the meat and rub the salt on the skin. 7. Preheat the oven to 200C. Place the pork, skin side up, on a wire rack in the oven, and place a tray underneath to catch the drippings. 9. Remove to a wire rack to cool slightly. Cut into long strips then slice and serve warm. Thank you, Sonia, for sharing this wonderful recipe! It has really benefited me and my family. As today is the second day of the Chinese New Year, many of us are probably busy visiting family and friends back home. So, let me take this opportunity to wish all of you a sound journey and to enjoy this time of happiness! Happy New Year Aunty Young. This post reminds me that I must make roast pork again. My family's favourite. I agree it's economical to make your own and you can choose a good cut to make the best siew yoke. Gong Xi Fa Cai Kimmy! 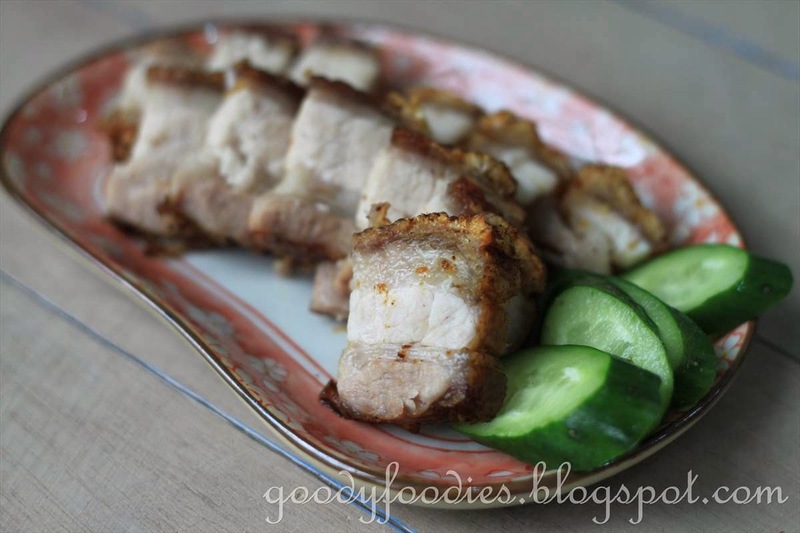 I love this crispy roast pork with rice. I am drooling now.